Founded on the groundbreaking work of researchers from Dartmouth Medical School and Dartmouth-Hitchcock Medical Center, Dynamic Clinical Systems (“DCS”) helps health care organizations measure and analyze patient-reported health history and outcomes, and provides insights into the process of care. Through real-time data capture and analytics, physicians and care teams can respond to patient feedback before, during, and after treatment, thereby enabling care providers to better improve engagement and outcomes. DCS is headquartered in Hanover, New Hampshire. Shields & Company represented DCS in its sale to Press Ganey Associates, Inc. (“Press Ganey”), the leading patient experience improvement firm in the United States. The acquisition bolsters Press Ganey's Patient Voice™ portfolio for health care organizations, enhancing its ability to collect, measure, and analyze patient-reported data. 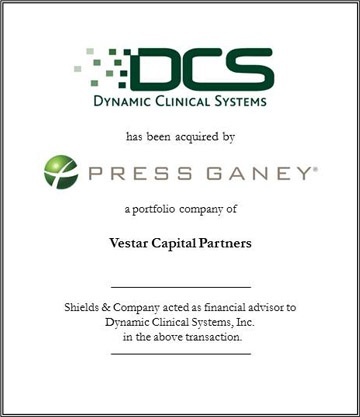 Through a partnership with Press Ganey, DCS gains the sales force and national marketing presence needed to significantly expand its footprint in the health care space. By combining patient-reported outcomes with Press Ganey's suite of patient and employee products and services, clients will be able to garner deeper patient insights to drive segmentation and further focus their improvement efforts. Shields & Company acted as a financial advisor to Dynamic Clinical Systems, Inc. in the above transaction.